Adds checkboxes to keybind dialog for user account wide shared keybindings. 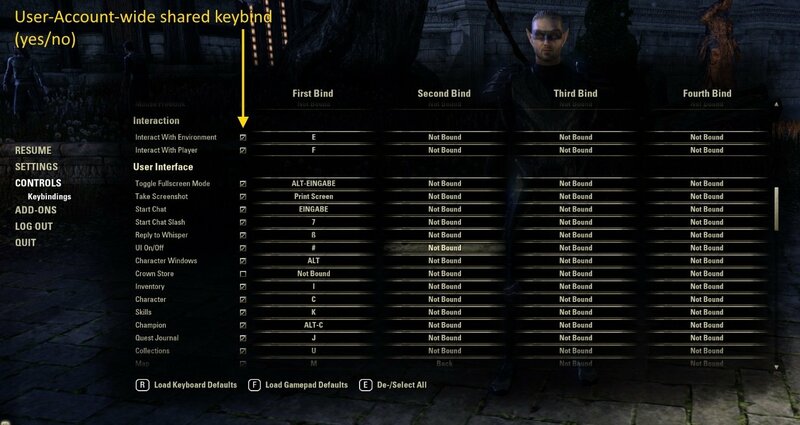 Technically ZOS is right, if they say keybindings are a per-character setting, because they can differ. But in consideration of the human factor most keybindings will not differ. I (and this addon) assume everybody has a prefered keyboard-layout, which is used across all characters. Only a few keys will be re-used for different, character specific addons. If you agree, this addon may something for you. It is tested with and supports Emacs to use key-modifiers like ALT, STRG etc. It is tested and works with libAddonKeybinds, which splits the list of keybindings into standard and addon. Upon first load all standard keybindings are marked as shared. Please verify it's how you want it. Once you log to other character these keybindings will be taken over! Shared keybindings are used for new characters, too. - Fixed missing dependency for LibStub. Manifest file was missing. - Delay syncing key-binds. Hopefully fixing the reported key-binding issues. - Just to be sure to not causing key-binding errors, the key-bind action layer of the "Controls" dialog is removed a bit earlier as ZOS does. - Fixed an issue in the text-search filter showing key-bindings which should be hidden, because they have no caption. - Japanese translation. Thanks to @BowmoreLover. - Categories and actions of addon-keybindings get sorted alphabetically. - Mark unbound standard key-binds on select-all. - Embedded libAddonKeybinds to split standard and addon key binds. - Remember actions without any keybind, so it can be used to unbind for all characters. - As requested by merlight, the addon is more hook-friendly to other addons. - Fixed issue with unlocalizable key-bindings (not in list) set by Binder: Ignored as build-in code does. - discovered and fixed an issue with modifiers: Some keys always had a modifier*. *If using Emacs. Hi, i really like to play pve content on xbox cotroller, and i use some keybind like hold D-Pad Down to open Mail, and others, is it possible to include Controller Buttons on you Keybinder? I have no controller, so I don't know. But it should. Because the addon just restores key-binds done with the base UI. Thank you Very Much for the fast reply, but it seems not to work. I don't know if i'm doing something wrong. When I installed this, all my addon keybinds were hidden/removed? It didnt transfer anything to my other characters. All my alts are pre-existing, not sure if it wouldn't work in this regard? Depends on what you mean with "hidden". Do you see the second menu entry, which splits standard key-binds and addon key-binds? If not, it could be a conflict with another addon. Last edited by votan : 12/07/18 at 12:25 PM. Thanks for the feedback. I indeed have forgotten something. Sorry. Please try 1.2.9. Thanks for responding so quick and the fix! Last edited by votan : 08/19/18 at 03:31 AM. "Yes" is the answer to "is there a reason for this ?" ? Let me rephrase: what use is there for this? Could I just delete the manifests for the libs (as a friend suggested) since they get loaded anyway, or at least used to? They will not get loaded anyway anymore. Especially if they are listed. That's the point. The game client handles all the duplicates and selects the highest version. The use is less loading and parsing Lua source. With the last update, this addon suddenly had a new dependency in my addon-list, "LibStub"
There's multiple more "LibXXX" entries, which are not complete addons but Libraries as I understand, but nonetheless listed as addons. Is there a reason for this? All of them either have votan or Circonian as author. I am using Circonians Addon Selector, and my old Selections now all need to be updated, bc addons didnt get loaded bc of new dependencies.